Heidi Bucher, 'Kleines Glasportal, Bellevue Kreuzlingen' (Small glass portal, Bellevue Kreuzlingen.) Installation view at Parasol unit, London, 2018. Photograph by Benjamin Westoby. Julian Charrière, installation view at Parasol unit, London, 2016. Photograph by Jack Hems. Courtesy of Parasol unit foundation contemporary art. Martin Puryear, installation view at Parasol unit, London, 2017. Photograph by Benjamin Westoby. Courtesy of Parasol unit foundation for contemporary art. Rana Begum 'No. 161', 2008. 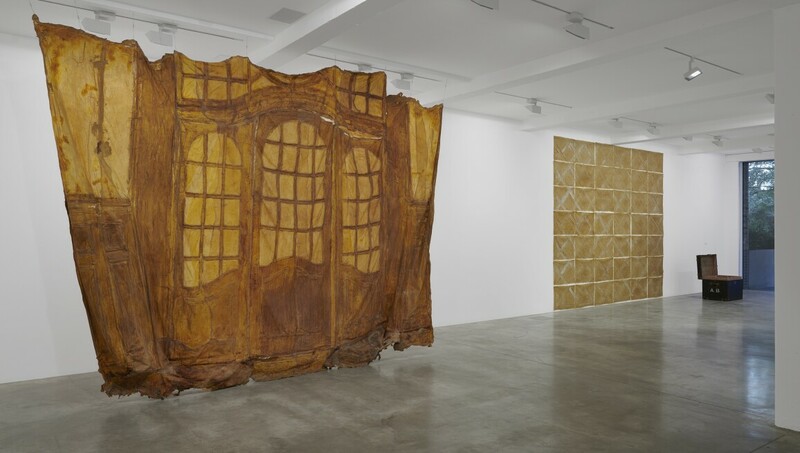 Installation view at Parasol unit, London, 2016. Photograph by Jack Hems. Courtesy of Parasol unit foundation for contemporary art. Internationally recognised for its forward-thinking and challenging exhibition programme, Parasol unit has introduced a host of international artists to London’s public and has been instrumental in launching the careers of artists such as Rana Begum, Michaël Borremans, Julian Charrière, Tschabalala Self and Yang Fudong. Every year the foundation presents challenging and thought-provoking exhibitions of works by British and international contemporary artists working in various media, which are usually documented by an accompanying publication. The foundation also organises various artistic projects such as its Parasolstice – Winter Light series. Parasol unit, like publicly funded institutions in London continuously strives to raise funds to cover its running costs and hopes to secure its existence for future generations. The one-time donation by the founder is a reserve that allows the foundation to operate while other funding sources are identified. The reserve currently covers about 60% of the foundation’s operating expenses whereas the remaining 40% are financed through Gift Aid scheme, grants from charitable organisations, private donations and sales of merchandise. Thanks to this innovative model between private funding and public support one of London’s most vibrant contemporary art spaces has come to exist and thrives. The foundation also engages with the public and neighbouring community through a full programme of educational events for children, young people and adults. In its genuine mission to serve the public, the foundation does not bear the founder’s name and its exhibitions do not derive from any particular private collections. Admission to all exhibitions at Parasol unit is free of charge.